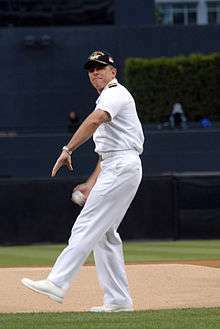 Terry B. Kraft, commanding officer of USS Ronald Reagan, throws out the ceremonial first pitch prior to a 2007 game honoring the ship. The San Diego Padres 2007 season began with the Padres' attempt to win a third consecutive NL West title. After finishing the regular season with 89 wins and 73 losses, they were in a tie with the Colorado Rockies for both the NL wild card and second place in the NL West, they were defeated in a tie-breaker which placed them third overall in the division and out of playoff competition. November 8, 2006: Kevin Kouzmanoff was traded by the Cleveland Indians with Andrew Brown to the San Diego Padres for Josh Barfield. December 20, 2006: Marcus Giles was signed as a Free Agent with the San Diego Padres. January 3, 2007: Pete Laforest was signed as a Free Agent with the San Diego Padres. The Padres ended tied with the Colorado Rockies for both second place in the NL West as well as the National League Wild Card. A tie-breaker was played on October 1, 2007 in Denver to determine which team would continue on to post-season play. The game lasted 13 innings through four hours and 40 minutes. The Rockies won the Wild Card spot with a final score of 9 to 8, and the Padres' season was over. March 21 spring training game against the Milwaukee Brewers at the Peoria Sports Complex in Arizona. Chris Young pitching against the Cubs at Wrigley Field on June 16; he was working on a no-hitter but was later ejected from the game after he and Derrek Lee got into a fight that turned into a bench-clearing altercation. Doug Brocail of the Padres throws a pitch to Jeff Francoeur of the Braves on July 7 at Petco Park. 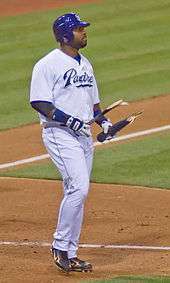 Milton Bradley on August 28, after striking out and deliberately breaking his bat. Khalil Greene on September 16, in a game against the Giants. 1 2 "Archived copy". Archived from the original on January 31, 2010. Retrieved 2010-08-18. Wikimedia Commons has media related to 2007 San Diego Padres season.